Chairman, All Progressives Governors' Forum and Governor of Imo State, Rochas Okorocha has threatened to dump the ruling party if his preferred Governorship candidate and son-in-law, Uche Nwosu is denied ticket. Governor Okorocha made this disclosure Friday during the swearing in of new Commissioners in the state at Nicks Banquet Hall, Government House, Owerri. The two time Governor also vowed to dump President Muhammadu Buhari's re-election should any attempt was made to drop his son-in-law in the 2019 governorship election. According to him, President Buhari cannot win any election in the South East geo-political zone in particular and Nigeria at large in 2019 without his contribution, warning that any attempt to subvert his choice candidate would be counter productive to the party in the country. He boasted that if not by his personal recognition and connection, President Buhari would not have been allowed into the South East to canvass for vote, let alone winning the general election in 2015. He therefore challenged President Buhari, Chairman of APC, Adams Oshiemole and members of the National Working Committee of the ruling party to dare him and see if the party would not record total failure in 2019. 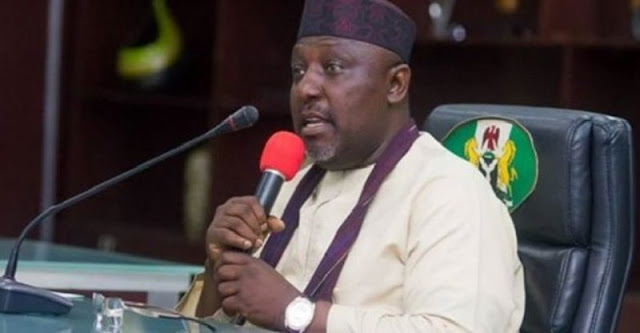 Governor Okorocha while charging the new Commissioners to inject their wealth of experience to ensure the development of the state, further told them to remain calm and wait for any possible directive from him should the party fails to give Uche Nwosu Governorship ticket. Meanwhile, Adviser to Governor Okorocha on Electoral Matters, Barrister Steve Asinobi has blasted the National Chairman of APC, Adams Oshiomole over what he called orchestrated plan to relegate his boss politically, describing him as a Biblical Nichodemus who should not be trusted. Barr Asinobi warned that if his boss son-in-law, Uche Nwosu is denied party ticket, their followers would not hesitate to destroy APC not only in Imo State but the entire South East. He gave this warning during his outing on a live TV and Radio programmes on AIT and Imo Broadcasting Corporation (IBC) respectively. Barr Asinobi threated that APC would become a history in the state once Uche Nwosu's name is expunged as Governorship candidate of the party in 2019.